Shiksha The Gurukul, School Tinsukia (Assam) Recruitment 2019 March :- Welcome to North East India's No. 1 Job Portal NeCareer.com . Shiksha The Gurukul, school is affiliated to the Council for the Indian School Certificate Examinations, New Delhi upto Indian Certificate of Secondary Education (Year 10) Examinations and Indian School Certificate Examination (Year12). 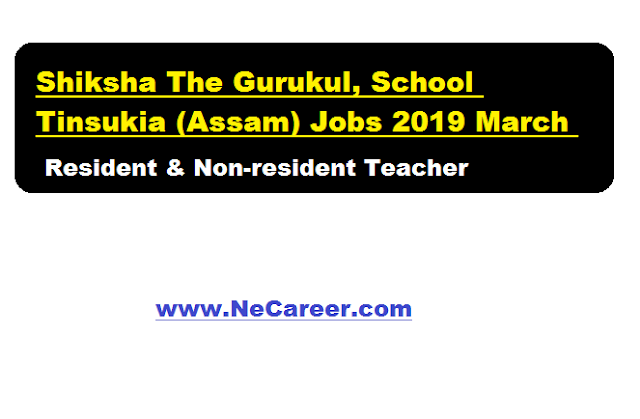 According to a latest vacancy published in there website , applications are invited to engage Resident & Non Resident Teachers for Secondary & Senior Secondary classes.The details of the job is mentioned below. Subjects: Physics. Mathematics, History & Physical Education. Eligible & interested candidates may send mail to shikshathegurukul.admin@gmail.com with mark sheets within 7 days.